Benitta began her journey with Legacy Group as early as her high school days where she worked as a receptionist. After her undergraduate degree, she served as a cashier and later as an Assistant Accountant. Benitta also worked with Legacy distributors. She has a wide range of marketing experience from all over the world and notable is when she worked with a leading marketing and PR agency in Hong Kong. 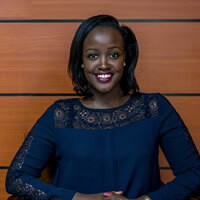 In August 2016, she moved back to Uganda to help grow the Legacy brand as a Finance Director but also helps in management of the residential properties and also in marketing.